Priced for each. 10 bolts needed for VR6 applications, 6 for 4cyl. Will not work with dual-mass flywheels, only single-mass. This is a high quality, American made ring gear bolt kit, brought to you by ARP out of California. This is absolutely the highest quality ring gear bolt kit you can find. Replaces the awful VW "rivets" on the 020 transmission ring gears. You will never toss a ring gear through a case with a set of these bad boys. ARP 204-3001 This is a high quality, American made ring gear bolt kit, brought to you by ARP out of California. This is absolutely the highest quality ring gear bolt kit you can find. Replaces the awful VW "rivets" on the 02A and 02J transmission ring gears. This is a high quality, American made ring gear bolt kit, brought to you by ARP out of California. This is absolutely the highest quality ring gear bolt kit you can find. Replaces the awful VW "rivets" on the 02M transmission ring gears. These are the new Level 0 performance axles. Using a chromoly center bar, a real billet inner cv with a larger oversized tripod and a new heat treat on our 1117 billet outer. The outer cv is custom made with a single arc design; this is a time/wear advantage over the factory dual arc design that tends to wear out prematurely. This is a superior axle for any stock replacement. These axles are designed as an alternative to cheap re-builts or inferior aftermarket axles on the market today. It is a quality axle and better than any replacement axle, it's just not what we would consider a real racing axle (sorry no warranty against breakage). If you don't see axles you need just email us, we can make anything. Price listed is for both left and right axles. These are the new Level 2.9 400HP axles. The set now features our chromoly cross groove 100mm inner CV. The standard 100mm inner CV has a very large internal spline (1.125 in diameter) the problem is that the outer CV internally has a much smaller diameter spline. What we have done is made a custom bar and CV races for both ends. We have made the inner CV spline smaller and the outer CV spline bigger, equalizing the bar size and make it significantly more torsional. This will be a very large advantage to any other axle on the market today. The outer CV also sports a newly designed cage and race that is thicker and 50% stronger than previous models. This is a direct bolt in unit and has a 1 year warranty. Don't be fooled by inexpensive aftermarket replacement style axles, they are not in the class of the Level 2.9 axles. The 1993-1998 Golf / GTI / Jetta / Corrado VR6 (with 6-speed conversion) Level 2.9 500HP Direct Bolt-in Axles are now available. The new Direct Bolt-in axles feature our high grade aircraft quality material axle bars that are significantly stronger and more torsional than the factory axle bars, with outer CV's made from a special proprietary material that fit the factory hubs. We also include 108mm bolt-on inner CV's that will bolt to the factory drive flanges into the transmission. Rated to 500HP with a 1-year warranty. 1999-2005 Golf / GTI / Jetta / Beetle (VR6/1.8T) 5-Speed Manual Level 2.9 500HP Direct Bolt-in Axles. The new Direct Bolt-in axles feature our high grade aircraft quality material axle bars that are significantly stronger and more torsional than the factory axle bars, with outer CV's made from a special proprietary material that fit the factory hubs. We also include 108mm bolt-on inner CV's that will bolt to the factory drive flanges into the transmission. Rated to 500HP with a 1-year warranty. 1999-2005 Golf / GTI / Jetta / Beetle (VR6/1.8T) 6-Speed Manual Level 2.9 500HP Direct Bolt-in Axles. The new Direct Bolt-in axles feature our high grade aircraft quality material axle bars that are significantly stronger and more torsional than the factory axle bars, with outer CV's made from a special proprietary material that fit the factory hubs. We also include 108mm bolt-on inner CV's that will bolt to the factory drive flanges into the transmission. Rated to 500HP with a 1-year warranty. 2002-2003 GTI 337 Edition / 20th Anniversary Edition 6-Speed Manual Level 2.9 500HP Direct Bolt-in Axles. The new Direct Bolt-in axles feature our high grade aircraft quality material axle bars that are significantly stronger and more torsional than the factory axle bars, with outer CV's made from a special proprietary material that fit the factory hubs. We also include 108mm bolt-on inner CV's that will bolt to the factory drive flanges into the transmission. Rated to 500HP with a 1-year warranty. Price listed is for both axles. This is our Level 3 500HP Axle/Hub system for the 85-87 VW Golf / GTI / Jetta 5-Speed. This system starts with a set of high grade aircraft quality axle bars with our unique double temper and heat treat that makes them stronger and significantly more torsional than the factory axle bars. The inner CV features a proprietary cage and race set and the outer CV is about 40% larger than the stock VW one and we also include a custom hub to accomodate the larger outer CV spline. This kit includes both axles, hubs and extended 12mm ARP wheel studs. This system can also be made in custom sizes for hybrid applications also. Rated to 500HP with a 1-year warranty. Please Note: This Axle/Hub Kit is designed for drag race use only. This is our Level 3 500HP Axle/Hub system for the 88-92 VW Golf / GTI / Jetta 5-Speed. This system starts with a set of high grade aircraft quality axle bars with our unique double temper and heat treat that makes them stronger and significantly more torsional than the factory axle bars. The inner CV features a proprietary cage and race set and the outer CV is about 40% larger than the stock VW one and we also include a custom hub to accomodate the larger outer CV spline. This kit includes both axles, hubs and extended 12mm ARP wheel studs. This system can also be made in custom sizes for hybrid applications also. Rated to 500HP with a 1-year warranty. This is our Level 3 500HP Axle/Hub system for the 93-98 4-cylinder VW Golf / GTI / Jetta 5-Speed. This system starts with a set of high grade aircraft quality axle bars with our unique double temper and heat treat that makes them stronger and significantly more torsional than the factory axle bars. The inner CV features a proprietary cage and race set and the outer CV is about 40% larger than the stock VW one and we also include a custom hub to accomodate the larger outer CV spline. This kit includes both axles, hubs and extended 12mm ARP wheel studs. This system can also be made in custom sizes for hybrid applications also. Rated to 500HP with a 1-year warranty. The direct bolt-in 800HP axles are now available for the GTI 337 and 20th Anniversary Editions. These axles feature a direct fit outer CV that will fit the factory hubs and is made from a special proprietary material that is designed for high horsepower applications. The axle bars are made from a high grade aircraft quality material that is much more torsional than the factory axle bars, allowing them to twist and absorb shock loads, with a spline size that is significantly larger than stock. The inner CV is a108mm Porsche-type CV, with our proprietary cage and race set that is used on our highest level axles. The axles come with new bolts to mount the axles to the factory transmission flanges (must re-use the factory spindle bolts) and are complete and ready to install. Price is for both axles. The direct bolt-in 800HP axles are now available for the 2005-2011 Rabbit / GTI / Jetta / Jetta GLI 2.0 & 2.5 6-Speed Manual. These axles feature a direct fit outer CV that will fit the factory hubs and is made from a special proprietary material that is designed for high horsepower applications. The axle bars are made from a high grade aircraft quality material that is much more torsional than the factory axle bars, allowing them to twist and absorb shock loads, with a spline size that is significantly larger than stock. The inner CV is a108mm Porsche-type CV, with our proprietary cage and race set that is used on our highest level axles. The axles come with new bolts to mount the axles to the factory transmission flanges (must re-use the factory spindle bolts) and are complete and ready to install. Please Note: This Axle/Hub Kit is designed for drag race use only. This is our most extreme system for the 85-87 VW Golf / GTI / Jetta 5-Speed. What we have done is remove the drive flange going into the transmission and replaced it with an inner CV and spline plug. No more 108mm CV and flange, just a new billet inner like you would find on any of our VW Level 5 systems. These axles feature high grade aircraft quality axle bars and our 26 spline outer CV as can be found on many of our axle/hub kits. We also include a custom hub to accomodate the larger outer CV with mounting points for the factory ABS ring. This kit includes both axles, hubs and extended 12mm ARP wheel studs. This is the strongest kit you will ever need for your VW. Rated to 750HP with a 1-year warranty. This is our most extreme system for the 93-98 4-cylinder Golf / GTI / Jetta 5-Speed. What we have done is remove the drive flange going into the transmission and replaced it with an inner CV and spline plug. No more 108mm CV and flange, just a new billet inner like you would find on any of our VW Level 5 systems. These axles feature high grade aircraft quality axle bars and our 26 spline outer CV as can be found on many of our axle/hub kits. We also include a custom hub to accomodate the larger outer CV with mounting points for the factory ABS ring. This kit includes both axles, hubs and extended 12mm ARP wheel studs. This is the strongest kit you will ever need for your VW. Rated to 750HP with a 1-year warranty.d This is our most extreme system for the 93-98 VR6 Golf /GTI / Jetta / Corrado 5-Speed. What we have done is remove the drive flange going into the transmission and replaced it with an inner CV and spline plug. 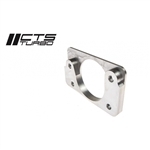 No more 108mm CV and flange, just a new billet inner like you would find on any of our VW Level 5 systems. These axles feature high grade aircraft quality axle bars and our 26 spline outer CV as can be found on many of our axle/hub kits. We also include a custom hub to accomodate the larger outer CV with mounting points for the factory ABS ring. This kit includes both axles, hubs and extended 12mm ARP wheel studs. This is the strongest kit you will ever need for your VW. Rated to 750HP with a 1-year warranty.